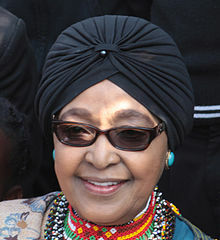 Nomzamo Winifred Zanyiwe Madikizela 9/26/1938 Bizana, Pondoland, Transikei, South Africa. A.K.A. First Lady of South Africa and Mother of the Nation. Social worker, activist, and politician. Headed African National Congress Women’s League. Married to Nelson Mandela for 38 years, he was imprisoned for 27 of those years. Imprisoned and spent time in solitary confinement.